Dublin Gasometer Converted To Apartments, originally uploaded by infomatique. I don't actually know what is happening with this redeveloped gasometer. 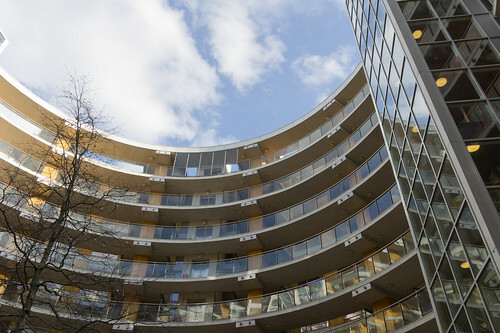 Initially 210 apartments were built inside this Victorian gasometer in the nine-storey cyclindrical building and most have been vacant since they went on sale a few years ago and failed to sell in sufficient numbers to make the scheme viable. The developer (Liam Carroll) applied for planning permission to build a four-storey glazed roof “springing” from the first floor level over the internal courtyard to incorporate this space in a hotel. There would be a new three-storey glazed entrance to the hotel. Fifty two residents of the Gasworks objected , claiming that a 500-plus room hotel is too big in a residential complex and would ruin the quiet and safe atmosphere of the development. Liam Carroll is a property developer in Ireland whose Zoe Developments group became well-known during the Celtic Tiger years of 1990s and 2000s for residential and commercial property construction projects. Zoe group companies became unable to repay bank borrowings of a reported €1.3bn and in summer 2009 requested Examinership as protection from creditors, particularly ACCBank who were the first to seek liquidation of some of his companies. Following a series of cases, this was rejected by both the High Court and the Supreme Court of Ireland with the rescue plan described by a judge as bordering, if not trespassing on the fanciful and the appointment of liquidators to group companies was confirmed by the courts on 14th October 2009.